My review copy: Borrowed from my local library. Father used to whisper that humanity didn't deserve saving. He said it with tears in his eyes, but I never thought he meant it. I know differently now. Just because you know something is right doesn't mean it isn't terrifying. "Is it hopeless?" I ask, looking up at him. Yesterday, walking through the city, I was overwhelmed by the odds of finding Father, particularly with the mob also hunting him. Will shakes his hair out of his face. "There's always hope," he says quietly. "I suppose we could spend all evening assigning blame. You are who are you, and all the villains want you." I wonder if he includes Elliot among the villains. "It's why I returned to the city. To do what I can to protect you." "As long as you don't get in my way," I say with more bravado than I feel." "Do you love him?" the maid ask once we are alone. "Yes." And if I survive the night, I will tell him so. Right off the bat I will tell you this: I enjoyed Dance of the Red Death more than Masque of the Red Death. The story line felt more involved, the characters more developed, the dialogue flushed out, and I felt more of an attachment to these characters and their plights. Picking up where we left off, Araby & Company have fled the burning city to gather their wits and save their lives. Elliott wants to head over to Prospero's to gather weapons, but Araby wants to go back to the city to find her father and a cure for April who has contracted The Weeping Sickness thanks to Malcontent. Of course the city holds many dangers: Prosero's men, Malcontent's men, The Weeping Sickness, The Red Death, so on and so forth. Araby definitely comes into her own with this book. She is that strong heroine who does what needs to be done for the greater good, but at the same time doesn't completely abandon the things that she wants. One of the best indications of this is she tells Kent at one point that she isn't here for kissing, but to find her father and a cure; however, a few pages later April calls her on it and Araby admits that she wasn't entirely truthful with Kent. April is definitely a favorite character of mine. Despite the fact that she is dying from The Weeping Sickness, she still cares about her appearance. This may sound shallow to some, but that's who April is. I love that she doesn't give in to this disease with a "woe is me" attitude. She stays true to herself and I absolutely love that about her. As far as the love triangle is concerned . . . meh. I can see the appeal of Elliott, and I certainly liked him more than I did in Masque of the Red Death, but I find him to be too possessive and feel like he only truly wants to be with Araby because she was "the scientist's daughter." There are definitely times where I wondered why he just doesn't pee on her to mark his territory. (Too graphic?) I love that Will allows Araby her space to do what she needed to do. You know he is hurt by the affection shown between her and Elliott, but he is calm and collected about it. At the same time, he protects her and you know his guilt over handing her over to Malcontent in exchange for Elise and Henry is eating him up. He just wants so much to make it right! There are certain aspects of the plot that I find to be too convenient and other things to be rather unbelievable. For instance, of all the places they could have *beep*, they just happen to do it *beep*. And Araby just happens to notice that *beep* and thinks that's weird, but chapters later Prospero happens to mention that *beep* is *beep* and she realizes that... I think you get the point. You'll also notice that I took the spoilers out for you. You're welcome. Over all, the plot is more interesting than its predecessor. I was pulled into the story right away, and while there are slower chapters, they don't deter from my overall enjoyment. 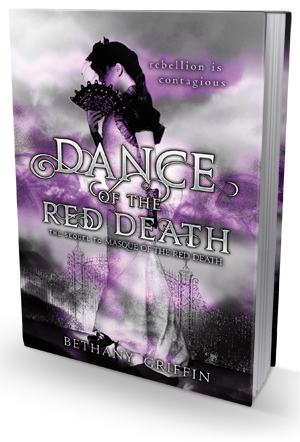 So if you are like me and are iffy about Masque of the Red Death, know that Dance of the Red Death is a step above, worth the read, and a good series ending.